Thank you to those that have signed the Petition "Keep the Peace" to keep the Peace Fountain in Peace Plaza. We have met with DMC, the architects of Coen+Partners and the City of Rochester. Coen+Partners have informed us that the Peace Fountain will remain in all their renderings in Peace Plaza. We now move forward to planning a 30th Birthday Party for the Peace Fountain. Save the date June 22, 2019. It will be a great celebration! The Peace Fountain was commissioned by the City of Rochester, MN in 1988. The dedication of the Peace Fountain was June 25, 1989, Next year we are celebrating 30 years of Rochester history. Many Rochester residents contributed money towards the creation of the Peace Fountain. These names are placed in a time capsule somewhere near the Peace Fountain. Destination Medical Center, created by Mayo Clinic, is wanting to redesign downtown Rochester, MN. 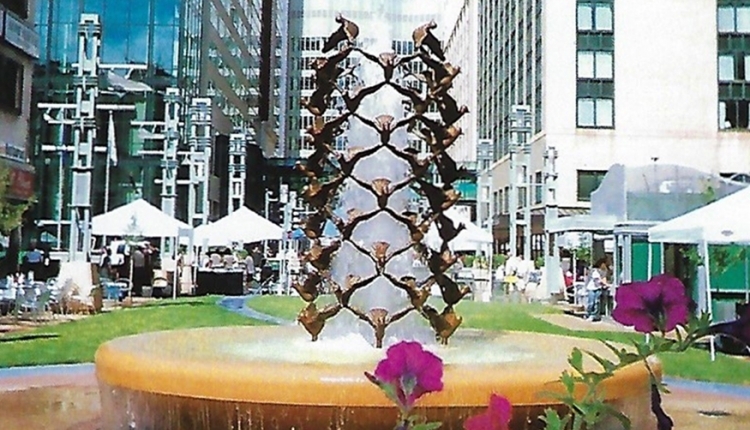 In their designs, by a Minneapolis firm, it shows no Peace Fountain and in some designs, a rename of Peace Plaza to Theatre Square. Although recently they have stated that it will stay where it is and that the Peace Plaza name will stay, there is still uncertainty and no 100% guarantee. We are in favor of a new exciting look for downtown Rochester and hope that the new Chateau Theatre, downtown renovations and Peace Plaza all co-exist to continue a vibrant heart of the city. Peace Plaza and the Peace Fountain has been a symbol of Peace for Rochester. Students that donated money stated that they wanted to bring their children and grandchildren back to the Peace Fountain in the future that helped inspire world peace. Keep the Peace Fountain in it's exact spot and do not change the name of Peace Plaza..
We the undersigned, are against the moving of the "Peace Fountain" and the renaming of "Peace Plaza" located in the heart of downtown Rochester, Minnesota. We want the Peace Fountain in it's exact spot and the name to remain "Peace Plaza". The "Keep the Peace" - Rochester, MN Peace Fountain & Peace Plaza petition to Rochester City Council members, Rochester, MN was written by Arlyn Gagnon and is in the category Arts & Entertainment at GoPetition.